The Park of the castle of Verteuil overhangs the village. Surprising small village with its small medieval alleys, its mill, the (XVIth) entombment and of multiple treasure of architecture has to discover during your walks. 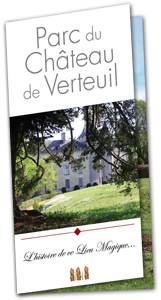 The castle builds XI ème century by the family of La Rochefoucauld which well that modified several times according to the adventures of the history in particular in XV and XIX ème siecle, always belongs has a member of this illustrious family. The author of the famous maxims François VI de La Rochefoucauld owner of the place has the period drafted his memoirs, during sound there exile forced by Louis XIV after the Revolt. The castle dominates the valley of the Charente and controlled formerly the road from Limoges to La Rochelle. Situated between the court of Spain and the Court of France. Today the park of the castle, all the Village, his storekeepers, restaurants, guest houses close relation of the road main trunk roads RN 10 and railroad, offer all the possibilities.